Never fear to smile again! 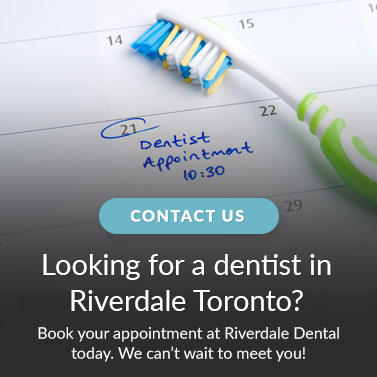 Riverdale Dental in Toronto provides porcelain veneer treatment for patients who wish to fix discoloured, chipped, gapped, misaligned or aged teeth. Veneers are a very thin, custom-made material that is placed on the front surface of your teeth to improve its appearance. These shells are bonded to the front of the teeth changing the size, colour, or length of the tooth. Dental veneers can be made from porcelain or from resin composite materials. Porcelain veneers resist stains better than resin veneers and better mimic the light reflecting properties of natural teeth. Riverdale Dental offers porcelain veneers for its Toronto patients. Repairing Imperfections: veneers can correct discoloured, chipped, broken, misaligned, irregularly shaped, and gapped teeth. Look and Feel Natural: veneers are customized to blend seamlessly with the rest of your teeth, from size to shape to colour. Low Maintenance: maintaining and preserving veneers is as easy as proper dental hygiene. Regular brushing and flossing should adequately maintain your restorations.